A coin with a key symbol on it. Key Coins are a special type of coin that first appear in Super Mario 3D World. 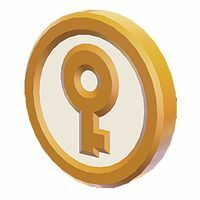 Five Key Coins have to be collected to unlock locked Warp Boxes, similar to how Mario has to collect five Star Chips in the Super Mario Galaxy games to make Launch Stars appear. A counter on top of the screen shows how many Key Coins have been collected and how many are left. Collecting a Key Coin gives the player 1000 points. Key Coins are found again in the Wii U version of Captain Toad: Treasure Tracker, where they are once again found in Clear Pipe Cruise. In Super Mario Maker 2, Pink Coins take the form of pink-colored Key Coins in the Super Mario 3D World style. World 5-1: Sunshine Seaside Scattered all around the main beach. World 6-1: Clear Pipe Cruise Towards the end of the level, a big Clear Pipe with many branches has 4 Key Coins, the fifth being at the beginning of it. World 6-3: Hands-On Hall Outside the building, scattered all around the place. World Castle -5: Trick Trap Tower Found on the second tower. When the Key Coin at the top of the tower is collected, a poisonous gas will fall through the tower. World Star -5:Super Block Land On the second floating island. World Star -6: Peepa's Fog Bog Scattered around the whole level. World Mushroom -2: Spiky Mount Beanpole The Key Coins are found on a new version of Mount Beanpole, the locked Warp Box is at the bottom of it. World Mushroom -5: Back to Hands-On Hall The Key Coins are found inside a building in a level similar to Hands-On-Hall. World Flower -12: Boss Blitz There are five bosses. The Warp Boxes warping the player to each one turns into a Key Coin after beating the boss. World Crown - Crown: Champion's Road All five Key Coins are found around many Ring Burners. This page was last edited on April 10, 2019, at 05:12.